After the devastation of the Medz Yeghern (literally ‘Great Crime’, as the Genocide is often referred to in Armenian), some of the Armenian intelligentsia survived and were left to ponder over the absurdity of what had happened. Many among them were writers, and, perhaps naturally, they took to expressing on paper what they had witnessed, a practice which became known as yeghernabadum (‘recounting the crime’). To speak on this topic with a focus on the writer-survivors of the period 1917-1922, Mr Raphael Gregorian of the Programme of Armenian Studies introduced Professor of Armenian Literature and Language Valentina Calzolari Bouvier of the University of Geneva, at which institution she established the first Swiss chair in Armenian Studies. Prof. Calzolari began her lecture by stating that yeghernabadum was, first and foremost, a response to the Genocide and a testimony of the writers’ experiences. Prof. Calzolari mentioned two main forms in which their work was written: the first was livres-images, which had the objective of telling the reader how the facts happened; the second was livres-reconstitution, which attempted to explain why the facts happened. The livres-images were the more popular choice of the writers, as they were a way to carry the reader into the events as a witness through the use of images, impressions, episodes and recollections. The first writer that Prof. Calzolari alluded to was the Constantinople-born Zabel Yesayan. Her writing career began after she had been sent as part of a delegation by the Patriarchate to Cilicia in 1909, two years after which she wrote Averagneru Mech (‘In the Ruins’), which tells of the miserable situation of Armenians in Cilicia after the Adana massacres. 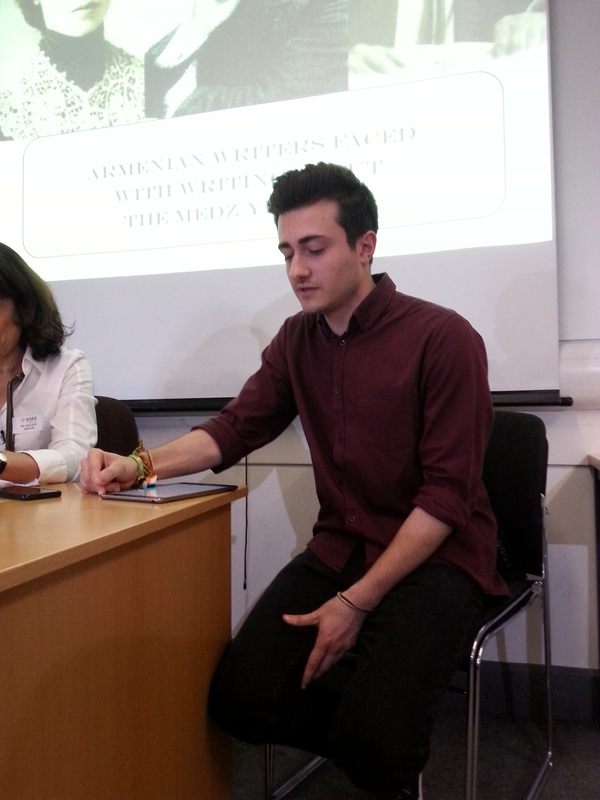 Professor Valentina mentioned a little-known work called Krakedi Më Hishadagner (Memories of a Writer) that Yesayan wrote after she had escaped to Bulgaria in 1915, which recounts the infamous execution of Armenian intellectuals on the 24th of April that year. Due to the risk that came with writing such a piece of work, the author used the male pen-name, Viken, to disguise her true identity. In 1917, Yesayan published Zhoghovurdi Më Hokevarkë (‘Agony of a People’), in which her approach to yeghernabadum changes as she recounts the memories of another character, Haig Toroyan. We see how the changes in the political atmosphere between the time of In the Ruins and Agony of a People affected Yesayan’s approach to writing about the plight of the Armenians. In the former work, the author makes an address to all Ottoman compatriots, including Turks and Armenians, so that they may look forward to a peaceful resolution of the situation and create a space for coexistence. It having become clear that such an initiative would be impossible, the latter work addresses only Armenians and foreigners, since this was the period when Armenians were fighting to keep parts of their homeland and to establish their own state. Another writer from Constantinople, Yervant Odian, recorded his personal memories of the deportations to the Syrian dessert in his work, Accursed Years: My Exile and Return from Der Zor, 1914-1919. In this work, Odian describes scenes from Hell that “any Dante would not be able to imagine”. He does not provide any commentary on the scenes that he witnessed, only descriptions. This was therefore a typical livre-image. After 1918 there seemed to be a hope in Constantinople that one would be able to start life anew. Literary activity was common in this period right after the worst of the deportations. A number of new literary journals were introduced, such as Partsravank, Amenoun Daretsuytse (Everyone’s Almanac), and Shant. It was as if this literary activity was the space within which the murdered Armenians were given the burial that they never received. The literature during this period was one of testimony; writers felt the need to write in this style as if it were their duty in order to perpetuate the memory of the victims, but to also provide a space for their souls to rest. It was also an existential endeavour; these writers had survived, and so attempted to find meaning in their survival by reasoning that their purpose was to testify what they had seen and experienced. Prof. Calzolari made extensive reference throughout her lecture to Grigoris Balakian, a bishop from Tokat who wrote of his experiences and impressions of the Armenian deportations in The Armenian Golgotha: Episodes of the Armenian Martyrdom, another example of a livre-image. Balakian felt that he had to write an impossible, anbadmeli (‘unrecountable’) book; however, during the deportations he fought to stay alive in order to tell the story afterwards of what he witnessed, and so already had the book in his mind while the atrocities were going on around him. Balakian thus expended much effort in locking away all that he saw in his memory in order to relate these recollections late on. This is reminiscent of the Italian Jewish Holocaust survivor, Primo Levi, who also claimed to have written his book in his mind during his time in the concentration camps. Prof. Calzolari also drew comparisons with Varlam Shalamov, a survivor of the gulags, who wrote about life in the labour camps. He said, “I had the impression that I already had this book in my mind when I was in the gulag”. These writers, from the Armenian Genocide to the Holocaust to the Great Terror, had the uphill task of transferring what they witnessed and experienced onto paper for the reader to be able to see through their eyes. In fact, the notion that these experiences are simply anbadmeli is mentioned on several occasions by these writers; Levi mentions that we have words to describe the atrocities that people experienced during these catastrophes, but they do not capture the depth of such experiences. Balakian expresses the same sentiment, saying that he felt that he was forgetting his mother tongue while attempting to put pen to paper, since the words were not coming to his mind, or if they did, they were insufficient to express the essence of the atrocities. There was also a fear that the words of these writers would not be believed, that their works were gross exaggerations. The great problem for the writer is that they cannot express the universality of such events, as it is only the witness who directly experiences them who can grasp their totality. Another point of commonality among these writers was their perception of what exactly they were writing. In Agony of a People, Yesayan considered it a “sacrilege to turn suffering into literature” and so approached her work with “simplicity and respect”. Odian echoes a similar sentiment in choosing to write in the simplest way possible, which Krikor Beledian called “la politique de la simplicité”, while Shalamov states, “I try to write not a narrative, but something that is not literature”. 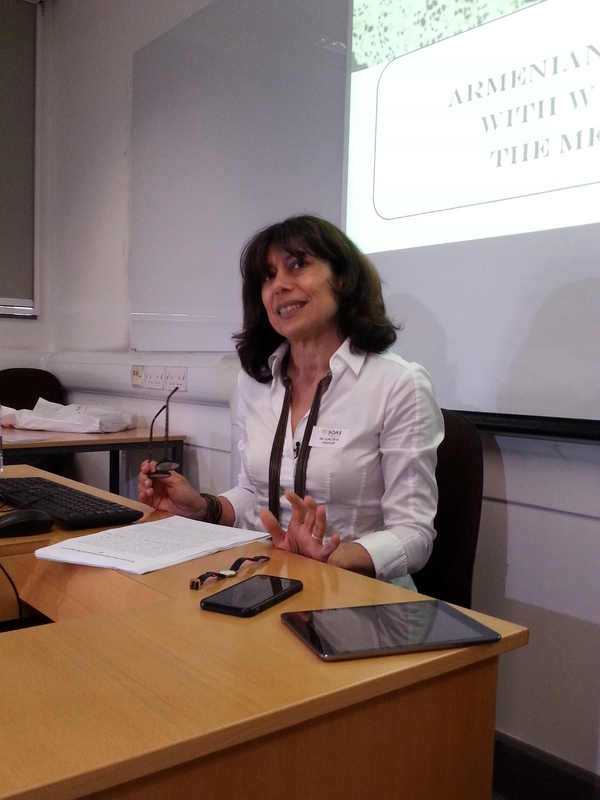 Balakian was the focus of the last part of Prof. Calzolari’s lecture. He attempted to renew the model of the ancient Armenian literary tradition; suffering and forbearance during martyrdom were essential elements of the Armenian identity for Balakian and he established a link between death (martyrdom) and collective rescue by portraying the victims as Christ-like figures, crucified as a sacrifice to the future prosperity of the Armenian people, which he links to the establishment of the Republic of Armenia. In this attempt, Balakian tries to make sense of the atrocities, as if they were non sine causa. This was a challenge for all the writers; however, Balakian’s solution was to refuse to believe in the absurdity of the atrocities, and hang on to the idea that the sacrifice of the Armenian people was not in vain. In the question and answer session that followed the lecture, one member of the audience made a comment stating that the language of martyrdom used by Balakian (i.e. Armenians died in the Genocide to make possible the establishment and flourishing of the Armenian state) still lingers in Armenian society today, a fact which was evident from the 100th anniversary commemoration in 2015. Professor Valentina agreed with this point, and asserted that attempts made to find a purpose behind the Genocide are futile, since the event itself was nonsensical. A discussion ensued on the general trivialisation of the Genocide in Armenian communities, in which this catastrophe is portrayed in an easily “consumable” manner, ignoring the depth of the event, as well as with its roots and its repercussions. By leonaslanov in Uncategorized on August 30, 2016 .